Editor's Note: As I've mentioned before, mining is a National Security issue. PLP and MMAC are taking the correct approach by making this proposed legislation a National Security issue. If you haven't yet read the proposed legislation, you can view it on our site here. Public Lands for the People (PLP) would like to bring you up to date on the Minerals and Mining Advisory Council (MMAC) meeting with General John F. Kelly, USMC Commander, U.S. Southern Command, and Howard “Buck” McKeon, former Chairman of the Armed Services Committee. This meeting took place Friday, November 6, 2015 where the parties discussed MMAC’s new proposed legislation “Minerals and Mining Regulatory Reform Act a Clear Path Respecting Mining Rights”. PLP and MMAC are in negotiations with the McKeon Group LLC to have the firm deliver the MMAC Bill to the House and Senate Floor as soon as possible. Also present at this meeting was MMAC Counsel Bill Jensen, PLP Board Member Pat Keene, PLP President Walt Wegner, and MMAC Founder Joe Martori. PLP’s primary responsibility in its association with MMAC is to administer the donations received on MMAC’s behalf. We are supporters of the MMAC mission to pass legislation to put miners on equal footing with other Federal agencies and have miners control their destiny within the organized mining districts. Even with our MMAC involvement, PLP’s primary energy will continue to focus on our ongoing court litigation and the interests of our members. Learn more about MMAC’s mission. Review key documents of interest. Contact a MMAC counsel with questions you may have. Learn how you can donate to support this legislation. The PLP/MMAC Team at the McKeon Leadership Forum. 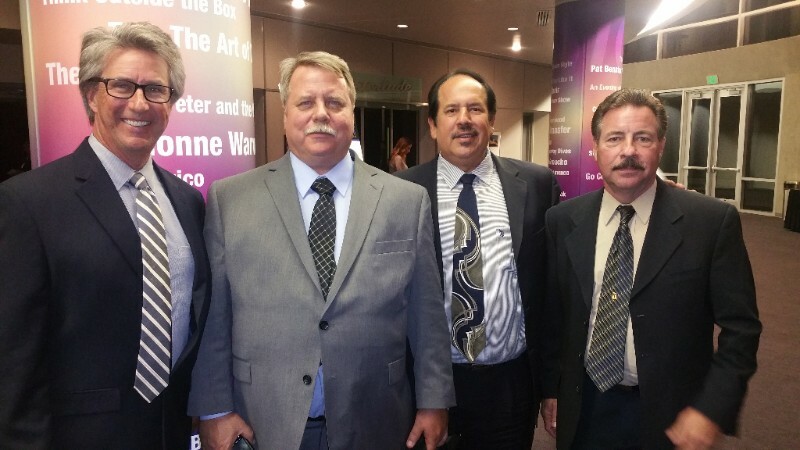 (L-R) Walt Wegner, Pat Keene, Joe Martori, and Bill Jensen. The PLP/MMAC Team with Morris Thomas, Regional Director of The McKeon Group LLC. Members of the PLP/MMAC Team with Howard "Buck" McKeon (center) and General John F. Kelly.